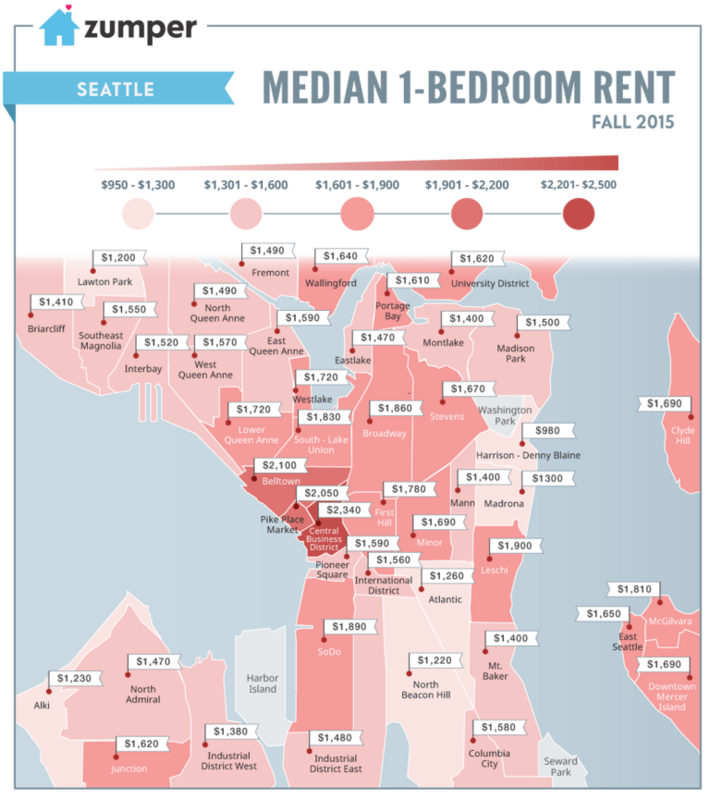 You can click the map to zero in on neighborhood rents for one bedrooms in greater Seattle. Bellevue made list of top expensive neighborhoods in the country with rent for a one bedroom averaging at $2220, as did Kirkland at $1710. Realtor.com reports that the average rent for a 1 bedroom in King County is $1801 and $2442 for a two bedroom unit. This is no surprise to folks who have been witnessing their rents continue to rise in the greater Puget Sound area. If you want to control your monthly housing payment, it may be time to consider buying a home. What sales price can you afford if you’re paying $2200 in rent? Here are some possible scenarios with low down payments. $330,000 using an FHA mortgage with 3.5% down payment. Quoting 3.750% (apr 4.803%) priced with a rebate credit of 0.876% to reduce closing cost. FHA 30 year fixed mortgage with a $324,022 total loan amount. Estimated funds due at closing: $15,782. This includes down payment, closing cost and prepaids/reserves. $325,000 using an FHA mortgage with 3.5% down payment and the National Home Buyers Fund Grant. Quoting 4.375% (apr 5.581%) priced with 1.5 points. FHA 30 year fixed mortgage with a $319,113 total loan amount. NHF Grant in the amount of $15,681. NOTE: The NHF Grant is NOT paid back. Income limits apply. $103,040 is the income limit for King County and Snohomish County as of the writing of this post. Pierce County income limit is $84,640. Estimated funds due at closing: $6,980. This includes down payment, closing cost and prepaids/reserves and the grant. $375,000 using a VA mortgage with 0 down payment. Quoting 3.750% (apr 3.937%) priced with a rebate credit of 0.567% to reduce closing cost. VA 30 year fixed mortgage with a $383,062 total loan amount. Estimated funds due at closing: $2,953. This includes down payment, closing cost and prepaids/reserves. NOTE: VA mortgages are a benefit that are eligible to those who have served our country. $345,000 using a Conventional mortgage with Home Advantage Down Payment Assistance (dpa). Quoting 4.750% (apr 5.018%) priced without points. Conventional 30 year fixed mortgage with a $334,379 total loan amount. Home Advantage DPA in the amount of $13,375 at 0% apr. Payments deferred for 30 years as long as you own and occupy your home (it may need to be paid off in the event of a refinance). Income limits apply: $97,000 for Washington state. WSHFC approved Home Buyer Education course required. Estimated funds due at closing: $6,897. This includes down payment, closing cost and prepaids/reserves and the dpa. $370,000 using a Conventional mortgage with Home Advantage without down payment assistance. Quoting 4.000% (apr 4.246%) priced without points. Conventional 30 year fixed mortgage with a $358,609 total loan amount. Estimated funds due at closing: $21,354. This includes down payment, closing cost and prepaids/reserves. Rates and programs quoted above are from October 30, 2015 at 9:00 am based on credit scores of 720 – 739. Rates quoted are subject to credit approval and may change at any time. This is just a small sample of the mortgage rates and programs that I have available. Your first home may not be in Seattle, Bellevue or Kirkland and it may not have a large yard or booming views. Odds are, it will probably be more of a traditional “starter home” and, better yet it will be yours. You’ll have more control over your housing payment. Property taxes may (will) adjust as may your home owners insurance. If I can provide you with a detailed scenario for your Washington home, please contact me.